TAYBERRY, BUCKINGHAM (Rubus Tayberry Group Buckingham). Fruit. 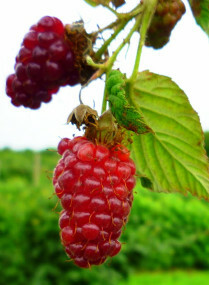 Spineless variety with vigorous stout canes, and enormous berries resembling Loganberries, of excellent sweet flavour. Suitable for dessert, jam-making and freezing. Regular heavy cropper. Self-fertile. Plant 8ft (2.4m) apart. £12.95 Currently out of stock.